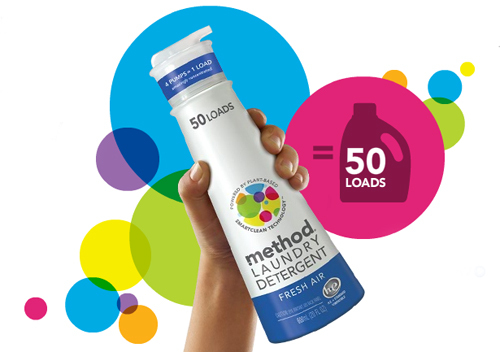 Method now has a new laundry detergent. One small bottle will do 50 loads of laundry! The bottle is cool too because it's a pump that won't let detergent drip everywhere. And of course the detergent is made of 95% natural and renewable ingredients so it's biodegradable and non-toxic! I am pretty excited because we got a new washer and dryer last year that only takes HE detergent but we didn't have a lot to choose from. Method Laundry Detergent can be used in HE and regular machines. It comes in fresh air scent, peony blossom scent and free + clear. Mmmm I like my socks to smell like fresh air. Method has had laundry detergents before - I bought one at Target awhile back. It was in different, more traditional packaging and it was clearance priced so maybe Method was making way for their new pump packaging.